KAKUTUR, NELLORE – 524 320-A.P. Filled in applications, along with a crossed demand draft for Rs.1500/-(Rupees One thousand five hundred only) or US $ 50/-(in the case of candidates applying from abroad) towards registration fee drawn not earlier than 23.11.2017 in favour of the Registrar, Vikrama Simhapuri University, Kakutur, Nellore-524 320-A.P, payable at Andhra Bank, V.R. College Campus, Nellore (IFSC Code:ANDB0001068) should reach the undersigned on or before 23-12-2017. The University reserves the right to fill or not to fill any or all of the above posts. The University is not responsible for any postal delays. Experience and qualifications will be reckoned as on the date prescribed for the submission of filled-in applications to the University. Good and clear photo- copies of all certificates must be attached to the application. 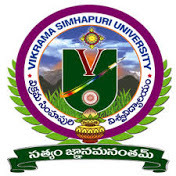 Please visit www.simhapuriuniv.ac.in for further details. This notification is issued consequent on the cancellation of the previous Notification No.7 dated 18-12-2013 and No.8, dated 24-12-2013 by the Executive Council at its 5th meeting held on 29-08-2017.